In our never-ending quest to find property on which to build our new house, we’ve been traipsing in… through… up… and over… tall, thick brush filled with ticks! This isn’t our first experience with ticks though. We’ve done our fair share of hiking, camping, and property searching together in Tennessee and Florida (where we’ve lived) and across the USA (where we’ve traveled together). What I’ve learned about the dangers of ticks (…like not all ticks carry the dreaded Lyme Disease). Which type of ticks are the most dangerous ones to look for in each area of the U.S.
How tick bites affect dogs. How long ticks feed on your blood — or your dog’s blood. 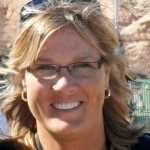 My personal experience with tick bites, the bullseye rash, and Lyme Disease. The best way to remove a tick — easy ways to remove ticks and how to get a tick off yourself or your dog quickly. There are a number of experts who have compiled lists of what Lyme Disease ticks look like, how to remove ticks, and how to prevent tick bites. Tick Identification: Which Type Bit You? Once they attach, ticks will feed on your blood and become engorged over a period of 72 to 96 hours. They say that a tick’s favorite areas on the human body are the armpits and groin area. But on Jim and I, ticks seem to prefer our legs (especially the calves and ankles), knees (front and back), and waist (especially at the underwear lines). In the northeastern, mid-Atlantic, and north-central United States… it’s the blacklegged tick (or deer tick) that spreads Lyme Disease. On the Pacific Coast… it’s the western blacklegged tick that spreads Lyme Disease. Here are lots of photos of ticks — so you can see what Deer Ticks and Western Blacklegged Ticks look like, compared to other types of ticks that do not carry Lyme Disease. Judging from the above information, my husband and I (and our dogs) have been bitten mostly by Lone Star Ticks — and we’ve been bitten by plenty of Tick Larva, too! Before this summer, I had never seen ticks as small as the ones we pulled off our legs, arms, and other parts. Apparently these are Tick Larva or Nymphs, and I’m here to tell you… they leave the itchiest bite of all! These tiny ticks are fairly easy to pull off your skin, but the itch lingers on for days — even weeks. There for awhile, my skin kept bruising from all the scratching that I was doing. These little buggers pack a mighty bite! Then I started using Benadryl and applying Cortaid to the bite — and the itching went away much faster. Neither Lone Star Ticks nor Dog Ticks are carriers of Lyme Disease. Since the tiniest ticks Jim & I pulled of ourselves were more brown than black in color, I can only guess that they were probably not the Deer Ticks that are responsible for Lyme Disease. 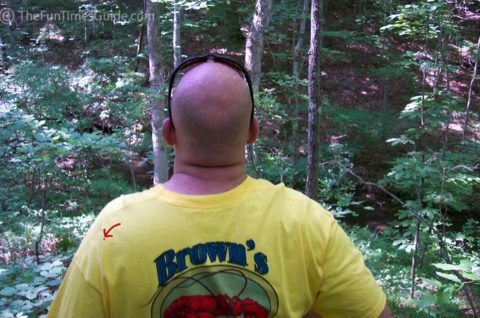 The #1 tip I’ve learned about ticks is the best way to remove a tick from your skin! So I thought I’d share. With the rise of Lyme Disease, there’s been an increase in the number of tools & gadgets that are available to remove ticks from your own body — and from your pet’s body. There are many tick removers and tools that are useful for removing ticks — but my all time favorite is TickEase. It’s the only dual-sided tick removal tool on the market. The takeaway: Using the scoop end, simply place it against your dog’s skin, slide it underneath the tick, and lift with steady even pressure. The takeaway: Use the fine-tipped tweezers end to get under the tick, against the skin and over the tick’s mouth parts. That way, you can easily pull it straight out of the skin. Here are the official instructions for using the TickEase Tick Removal Tool. 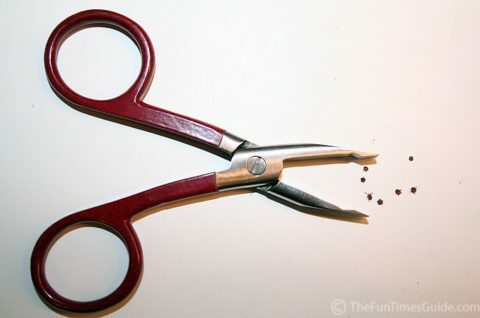 A few people have asked the best way to remove a tick without tweezers or a tick removal tool. Maybe you’re out in the woods and you notice a tick on your dog — but you don’t want the tick feasting on your dog for hours until you can get to a tick removal tool. Well, I told ya we’ve had our fair share of tick bites — right? It turns out one of the ticks that bit me was either a Deer Tick or a Western Blacklegged Tick — because I have Lyme Disease now. Since we live in Tennessee (and before that, we lived in Florida), most likely it was a Deer Tick. Our best guess is that my Lyme Disease came from a tick bite I remember over 6 months ago. I had a red rash about the size of a golf ball — and I took a picture of it — but back then I didn’t put the pieces together that it could actually be Lyme. It wasn’t until 6 months after that rash from a tick bite that I started experiencing the symptoms of Lyme Disease. Here’s what the Lyme Disease rash looks like. Every time one of us gets a tick bite, I’m careful to follow the best way to remove a tick that I’ve shared above. We’ve discovered another product that prevents tick bites better than DEET — it’s called Permethrin. I also learned that you can get Lyme Disease from your dog. Mine was obtained directly from a tick, not from my dog — but here’s how to tell if your dog has Lyme Disease from a tick bite. Here’s a little about my personal experience — what it’s like living with Lyme Disease. Check yourself and your pets for ticks any time you and/or your dogs have spent time outdoors where ticks reside. Here’s how to check for ticks on your body. Have a plan for quick & easy tick removal — know where your tick removal tweezers are and how to get a tick out yourself. Save any ticks that you remove — in case you eventually experience a rash or you start to have any unusual health symptoms. 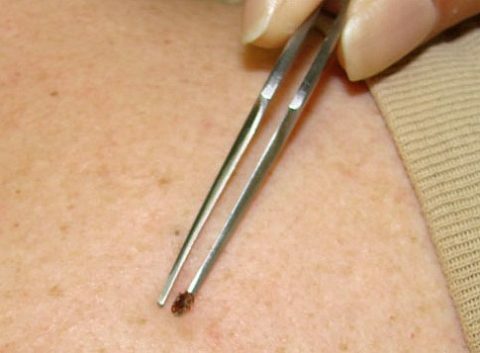 These days, most doctors have access to the tests to check ticks for diseases. You could also send the tick out for tick testing, but this generally isn’t recommended.